Dr. Stephen P. Kerr, former principal trumpet player at Liberty University, has been a band director for 31 years and is in his 26th year at Liberty University. He received his B.S. degree in music education from Liberty University in 1982, and holds an M.E. degree from Virginia Polytechnic Institute and State University. 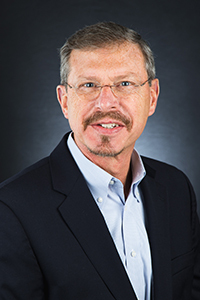 Dr. Kerr holds the PhD in Music Education with a minor in research from The University of North Carolina at Greensboro. He serves as Chair of the Department of University Bands, supervising all band ensembles, Director of the "Spirit of the Mountain" Marching Band, Director of the Wind Symphony, and teaches Instrumental Conducting, Marching Band Techniques, and applied trumpet. He has studied with principal trumpet for the Roanoke Symphony, Alan Bachelder, and Dr. Edward Bach, trumpet instructor at the University of North Carolina at Greensboro. Dr. Kerr studied conducting with Dr. James Glazebrook at Virginia Polytechnic Institute and State University, and Dr. John Locke at the University of North Carolina at Greensboro. He performs periodically in the Lynchburg area, and periodically serves as a band clinician and adjudicator in the mid-Atlantic region. Dr. Kerr is an active member of the College Band Directors National Association, The National Band Association, The Conductors Guild, The World Association for Symphonic Bands and Ensembles, the National Association for Music Education, and the Big South Conference Band Directors Association. The Liberty University Wind Symphony has demonstrated acclaimed performance levels, including performing at the 2008 and 2012 College Band Directors National Association Southern Division Conferences, by peer-reviewed invitation. The Wind Symphony enjoys an extended tour during the spring semester every year, performing at schools, churches and community events, including fun venues such as Miami’s Bayside and Disney World. The Liberty University Marching Band performs regularly in the new Williams Stadium, travels to exciting venues, and serves as a host for their own Marching Band Competition each fall semester. Alyssa Hurley is originally from Whippany, New Jersey. She has served as the Assistant Director for the Liberty University Marching Band since January of 2018. 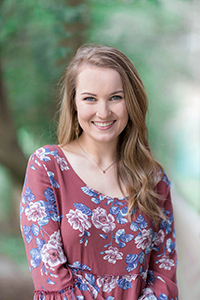 Alyssa graduated from Liberty University in May of 2017 with a Bachelor of Science in Graphic Design and a minor in Photography. She is a veteran mellophone player, having marched with The Spirit of the Mountain from 2013-2016. Prior to her involvement with Liberty University Bands, Alyssa played the flute for 8 years and marched with The Pride of Hanover Township, her high school marching band, as a member of the flute section for 3 years before joining the mellophone section during her senior year of high school. Alyssa continued to play the mellophone for all four years of her college career and was section leader during her senior year. After having graduated from Liberty, Alyssa returned to The Spirit of the Mountain for the 2017 season as the Woodwind Technician. Outside of Marching Band, she participated in the University Band playing the horn in the ensemble’s debut semester (spring 2014), the flute in the fall of 2015, and returning again to the horn in the spring of 2016 and spring of 2017. Outside of the music world, Alyssa is a professional wedding photographer and she owns her own wedding photography business, Blyss with Lyss, which she still operates while holding her position as Assistant Director. She and her brother, a Liberty student on the drumline, enjoy working together as the media team at weddings all over the east coast. Her sister is also a member of the marching band in the piccolo section. Along with her family, Alyssa enjoys spending time in the Adirondack Mountains in New York. Tyler Loftin, hailing from Beaufort, NC, is entering his eighth year back at LU, now as Assistant Director of Athletic Bands and Drumline. Tyler has also directed the LU Indoor Drumline since its founding in 2012. In April 2014, the LU Indoor Drumline placed 3rd in Percussion Independent A Class, and in 2013 placed 8th at WGI World Championships in Dayton, OH. In addition to his position at LU, Tyler has also been the Percussion Coordinator for the Jefferson Forest Band Program. His responsibilities included teaching 6-12 grade percussion classes and arranging battery music for the Cavaliers Marching Band. Tyler also composes original music and visual design each winter for the JF Indoor Percussion Ensemble. In 2004, Tyler moved to Lynchburg to attend LU as a student of music education. 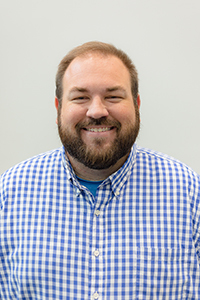 He studied percussion with Dr. Kevin Super, and held leadership roles as Principal Percussionist, Drum Captain and Officer during his time at LU. Tyler graduated in 2008 with a Bachelor’s degree in Music Education and Virginia K-12 Teacher Licensure. Tyler moved to Columbia, SC, in 2009 to pursue a Master’s degree in Percussion Performance from the University of South Carolina. He studied privately with Dr. Scott Herring, Professor of Percussion at USC. While at USC Tyler performed with many of the state’s finest musical ensembles including the USC Wind Ensemble, Symphony Orchestra, Percussion Ensemble, and Palmetto Pans Steel Band. Tyler’s recent performing experiences include his performance of Eric Ewazen’s Marimba Concerto with the LU Wind Symphony in April 2012, and also with the USC Symphony Orchestra in March 2011. Tyler also participated in the Collegiate Keyboard Competition at the Percussive Arts Society International Convention 2009 in Indianapolis, IN, and in addition, premiered a piece for solo marimba by composer Richard Power at the 2010 Society of Composer’ Inc. National Conference, which was hosted by USC. Bryanna Boyd is the Color Guard Instructor for the Spirit of the Mountain Marching Band. Bryanna has been involved in competitive Color Guard and Winter Guard since 2004. She was a member of Wallace Middle School Winter Guard in Bristol, Virginia from 2004-2005, John S. Battle High School Color Guard in Bristol, Virginia from 2005-2009 (served as a squad leader in 2007 and as captain in 2008 and 2009) and the “Spirit of the Mountain” Color Guard from 2010-2011. She has been the Color Guard Instructor of Lebanon High School in Lebanon, Virginia from 2010-2013 and Patrick Henry High School Color Guard in Glade Spring, Virginia from 2011-2013. As an oboist, she was a member of Wallace Middle School Symphonic Band from 2003-2006, John S. Battle High School Wind Ensemble from 2006-2010 and the Liberty University Wind Symphony 2011-2012. She also served as the Secretary/ Treasurer of the “Spirit of the Mountain” Marching Band and Wind Symphony from 2011-2012. 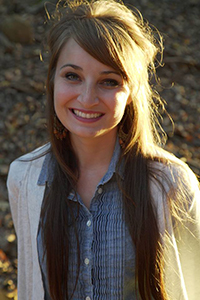 Bryanna graduated from Liberty University in 2014 with a Bachelor’s degree in English with a teacher licensure, and she graduated with her Master's degree in English Education in 2016. She is currently teaching English at a local high school.